Here is my latest article for Mobility Lab. It's part one of a two-part series that is helping me contextualize in my head the panel I'm moderating in two weeks at South by Southwest in Austin, Texas called "How to Uber-ize Public Transit to Save It." Smartphone owners feel connected much of the time, for better or worse. But shouldn’t that be the goal for physical movement as well, to be literally that connected – with a transportation system that could take one anywhere at any time? That’s a big ask. But what’s exciting is how realistic the vision is for cities that dramatically alter outdated transportation planning. And this is not just about the New Yorks and San Franciscos; auto-oriented towns and cities can develop completely new blueprints for how people get around. Many people and organizations have taken cracks at defining the connected city. Often these delve into the realm of Internet of Things-type technology. And beacons, smart traffic lights, and sensors are a big part of cities in the future. Of course, the major elephant in the room is always funding, most of which still goes to highways and roads, which have both divided and connected our cities over the past century. The good news is that autonomous vehicles and an increasing focus on making places bikeable and walkable could offer avenues for bringing mass-transit funding up above its typical level of 20 percent of the overall transportation budget. The bad news is that it’s still unclear whether the growth of services like Uber and Lyft will compromise transit funding sources or expand their pool of possible riders. The National League of Cities 2016 “Cities of the Future” report [PDF] made even clearer how cities are woefully prepared for new transportation technologies. Of the 68 metropolitan areas analyzed, only 3 percent considered the effects of app-based, on-demand companies like Uber and Lyft in their city plans. Only 6 percent considered the effects of driverless technology. Meanwhile, 50 percent have explicit plans for new highway construction. The federal government has taken some recent steps in the right direction, with an Obama administration report [PDF: pages 34-35] recommending pilots, workforce training, company and city partnerships, and research into future transportation engineering for autonomous vehicles. Some places are already making headway on these guidelines. In San Francisco, if new mobility providers meet the necessary requirements, the S.F. Office of Innovation’s new City Transportation Platform grants them access to public rights of way. 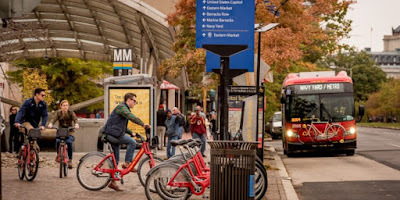 On a smaller, short-term scale, Washington, D.C’s Metrorail has been aggressively asking customers how it can improve, notes that “competitors” are really partners in connecting the region, and has been implementing some customer suggestions. These are the kinds of elements that need to go into comprehensive, nimble, flexible local transportation plans. New adhesives clarify for Metrorail riders where the end of six-car trains stop at the platform. The vision statements in many of the U.S. DOT Smart City Challenge applications show the beginnings of lights turning on. But other local officials still have a long way to go to research and understand carsharing, ridesharing, new technologies, and the needs of their constituents. Getting all of this mobility right will be a significant competitive advantage for cities, according to a recent report from McKinsey and Bloomberg. To make one or multiple connected cities happen, local governments – and perhaps the feds as well – will simply have to start jumping in the water more than they have so far. In Finland, a government bureau called Liikennelabra (Traffic Lab) works to bring inexpensive transit providers to cities. Part of the answer may be that simple – a more fluid array of public options. “What an agency looks like today may look different 20 years from now. A transit agency might be a contract manager, partnering with all sorts of entities. The question is: can we encourage folks to try? To not be afraid of failure?” Grisby asks. One example: Seattle has consistently supported its bus and rail transit in recent years, drawing higher rates of transit ridership to its booming downtown in a time when bus ridership is dropping in most cities. Seattle buses, which are given dedicated space in parts of the city’s downtown. It’s a bit surprising how successful transit projects are across the country. We’re still largely a drive-alone culture in which carpool rates have fallen consistently since the 1980s. To truly have a connected city, where people can move around seamlessly, people must be willing to share rides, and they must be aware of the availability of these options. There is indeed hope that people are increasingly understanding that they have non-driving transportation options available. More than 30 percent of households do not own a car in six of the 30 largest U.S. cities. And people want these options, as seems apparent by the 77 cities that applied for the Smart City Challenge and the influx of younger residents to places with transit and walking options. Connected cities must be woven into the fabric of people’s lives. There’s little doubt that Los Angeles is successfully experimenting with this concept. LA Metro is seeing a surge of new light rail riders to Rams football games because the Expo line offers a much-better deal than expensive parking at the stadium. Coordination around big events is a great way to help change people’s habits, and LA’s Olympic committee wants to further embed non-car culture into the city through its planning for the 2024 Games. Consumer-oriented technology certainly has a big role to play in educating people, too. Apps, such as Metropia, which incentivizes people to drive or travel during off-peak hours, or like Mobidot, which helps people monitor and improve their travel behavior, offer new options. Education efforts like these might be key puzzle pieces for creating connected cities. Next, a look into how cities are finding creative ways to enhance the connectivity of their transportation systems. Photos, from top: D.C.’s Eastern Market, where Metro riders can connect to the DC Circulator or Capital Bikeshare (Sam Kittner for Mobility Lab, www.kittner.com). A six-car Metrorail sticker (WMATA). Buses in Seattle (BeyondDC, Flickr, Creative Commons).